← What does a Corbyn victory mean? A few weeks ago the story broke that the Syriza-led Greek government continued military cooperation with Israel. Since the party has advocated ceasing all military cooperation with Israel, commentators on the left quickly classified this behaviour as degeneration and betrayal. The story was mostly reported on pro-Palestinian blogs such as Electronic Intifada and MondoWeiss, all being very critical of the behaviour of Syriza. Yet they all failed to dig deeper than simply noting the cooperation and that it ran counter to the programme of Syriza. Worse, Syriza was not contacted for any of these articles, a basic journalistic principle. So, impulsively, I decided to contact the international department of the party, not expecting much of a response. A few days later, however, I received a detailed reply, much to my surprise. The short story: Syriza claims it is due to ANEL control over the ministry of defence. To explain the Greek government’s Israel policy we need to go back to the January elections that brought Syriza to power. As everyone will recall the party failed to achieve a complete majority in the Greek parliament, running a few seats short of an absolute majority and forcing them to form a coalition government. Allying with the previous establishment parties ND and PASOK was out of the question, so was allying with the neo-nazi Golden Dawn. The KKE rejected an alliance out of hand, leaving the new parties To Potami and ANEL. The center-left To Potami was the obvious choice but it had a number of problems, for example that it had run in the elections without a programme and that there had been revelations about financing by Greek oligarchs. They had also been courted by the European social democrats, who wanted to establish a new foothold on the peninsula after the collapse of PASOK. Leaving the right-wing, xenophobic and highly eurosceptic ANEL. So in exchange for giving Syriza the few more seats it needed for a parliamentary majority, Syriza handed control over the ministry of defence to the leader of ANEL, Panagiotis “Panos” Kammenos. An alliance that the international radical left initially found preposterous, yet afterwards seemed to have forgotten about. This sets the scene for the explanation given by the international department of Syriza. The response by Panos Trigazis, Coordinator of International Relations and Peace Affairs Department of Syriza and long-time peace activist, assured me that Syriza as a party remained committed to its original programme. Note that when quoting his explanation I corrected spelling errors to improve readability but have not altered any other mistakes, as you can notice. 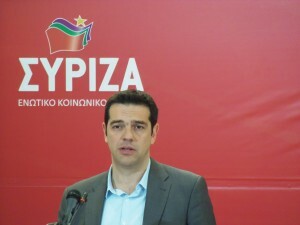 The reaction stated that Syriza still regards the two-state option as “the only realistic approach to solving the Palestinian Issue.” And that “Syriza has always being in favour of developing peaceful bilateral relations between Greece and Israel.” But that “We always to make clear that it is one thing to have relations with Israel and the people of this country. And the other thing is to tolerate the pro-war policies of successive Israeli Governments.” Summarizing Syriza’s policy he stated: “Previous Greek Governments had started military cooperation between Greece and Israel. As Syriza we opposed it continue to be against while, we are in favour of Greek Israeli Cooperation in the fields of economy, culture and the energy.” So Syriza, he argues, has not abandoned its commitment to ending military relations with Israel, but in the fields not related to defence is still open to cooperation. Syriza, in its own words, thus still remains committed to its demands of ending military cooperation with Israel while arguing for all other forms of cooperation with the country to continue. Now you could criticize Syriza for not going far enough and demand that it should cease all relations, or at least its energy cooperation, with the Israeli government, as some have done. Yet for the moment, in regards to claims of degeneration only the demands that were put forward in the programme of Syriza should be considered, not what ought have been. Notwithstanding the practical implications of completely ceasing contact with a close-by country when your economy is on the verge of destruction. Now, however you think of this move, whether we see it as a necessary compromise inherent in exercising power or a dangerous slip into parliamentarism, the entire affair should not serve as an excuse to drop rigour in our analysis. That even I managed to get an extended response from the party shows how easy it would have been for better connected leftist writers to do the same. Furthermore that nobody seemed to have put two and two together and suggested this might have been the result of the compromise Syriza made in January does not bode well for the critical character of left media. It also follows the narrative, so prevalent among the left, that most defeats are the result of ideological heresy, of deviation from a pre-set standard of pureness, of lack of steadfastness the analyst does posses. In essence: that our defeats are mainly ideological and have little to do with the objective conditions within which the left acts. A narrative that has been rigorously applied to basically any event of importance in left history. And which, as shown here, causes an analysis that is too reductionist to pass. Whatever your view on Syriza, if we are ever to build a mass appeal that deserves the name this looseness of thinking will need to cease. This entry was posted in Critique of the Left, Politics, Uncategorized. Bookmark the permalink.